I've done Pyramid from Twin Bridges (before it was illegal to park there) and from Echo Summit, but I recently ran across a report by George Sinclair who suggested it was better to climb from the west. Not wanting to do Pyramid again, but wanting to check out his Wrights Lake Road approach, I headed up Hwy 50 to see how far I could drive in the winter. 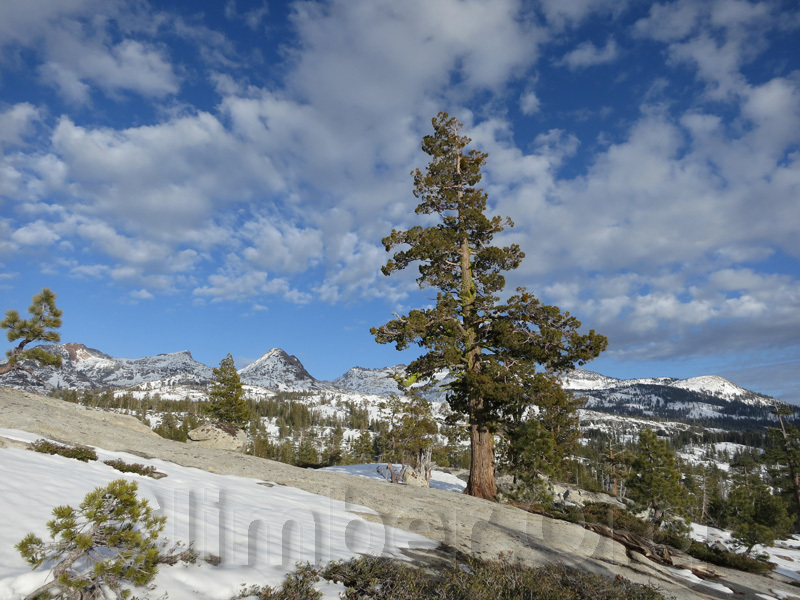 I only got about 1/3 mile from Hwy 50 on Wrights Lake Road, which is not accurate on many maps, before I encountered a snow drift that was just deep enough to make me worry. In a corner, ice underneath, a warm sunny day with almost no snow on the ground, I decided to just walk up the road. I should have gone for it anyway because I could have driven another 2 miles. Snowmobile trailers were parked around the side road to Wilson Ranch (waypoint WILRCH, 3 mi from Hwy 50). Beyond there the road levels and the loss of a southern exposure means the snow does not melt off. The main road is well packed from there to Dark Lake, with some side roads also having tracks. The machine-packed snow was soft enough that I had to wear snowshoes, but at least it was mid-week and the riders were not out in force. I had the Wrights Lake Campground, just south of the outlet of Wrights Lake, to myself. When I go alone I often start with a half day of driving and a half day of packing so this was as far as I got. Wrights Lake had several feet of snow but the picnic tables were melted out. Very civilized for a winter backpack trip. The NWS forecast was 35 degrees, but it was 20 degrees colder! No wind, full moon, lots of frost, everything was packed wet in the morning. Just north of Dark Lake (waypoint DARKLK) there was a locked gate and a sign for the start of the Barrett Lake Jeep Trail. It's hard to tell how this would be marked and where you could park in summer, but in winter this was the end of the snowmobile trail and where most maps show Wrights Lake Road ending. I went over a hump with no road or trail visible and crossed the Jones Fork of Silver Creek. At waypoint JONESF I located a large log across the stream, but it was a dicey crossing. The log was at least 5 feet above the water, which had an incomplete crust of ice above a 5' deep pool of running water. Still, it was better than wading across where the road fords the stream (just to the north of my waypoint). I picked up the road on the south-facing side of the stream, and climbed to just over 7k, then crossed the stream and went cross-country east of Mortimer Flat (waypoint MORTFL). Here there were nice dry slabs on which I dried my sleeping bag and tent, while soaking up views of Pyramid and Price. Since the road vanished when I came out of the trees, I walked a compass bearing and I re-joined the trail around 7.6k, just below Cow Saddle (COWSAD). 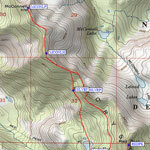 After a break, I traversed near the 7.6k contour line instead of taking the trail route down to Cow Camp. 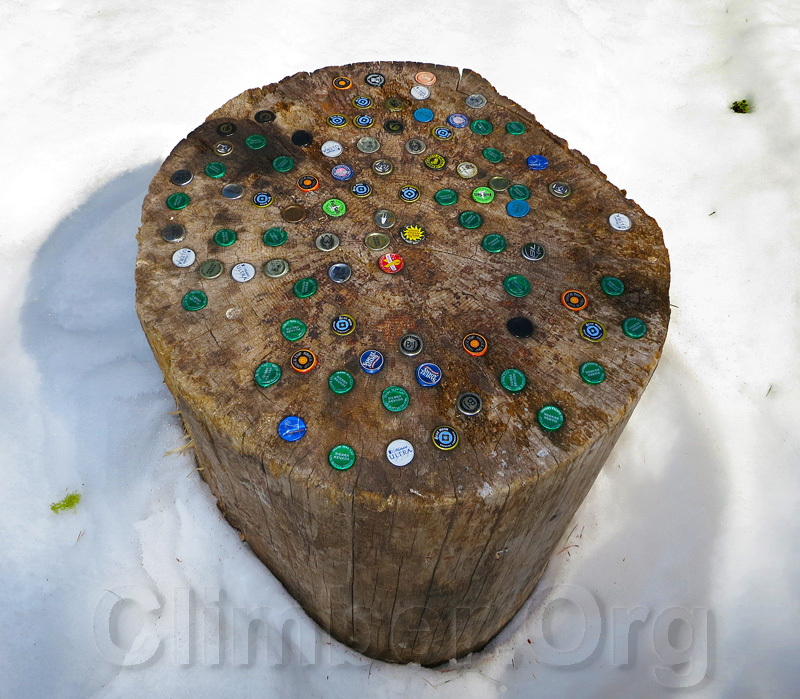 I found the trail again on the west side of Barrett Lake (BARETL) where there was evidence of much beer drinking. 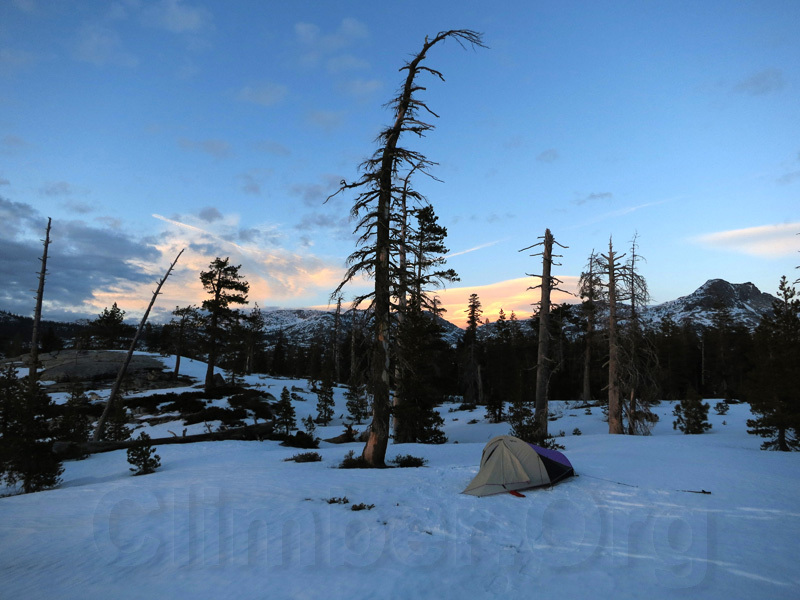 I drifted up and left before reaching Lawrence Lake, camping at the base of a prominent rib descending west from the Red Peak summit ridge (waypoint HICAMP). Literally pounding them down! Perhaps 4WDs can get here in summer? I left camp 230pm for Red Peak, going up the rib to the ridge. 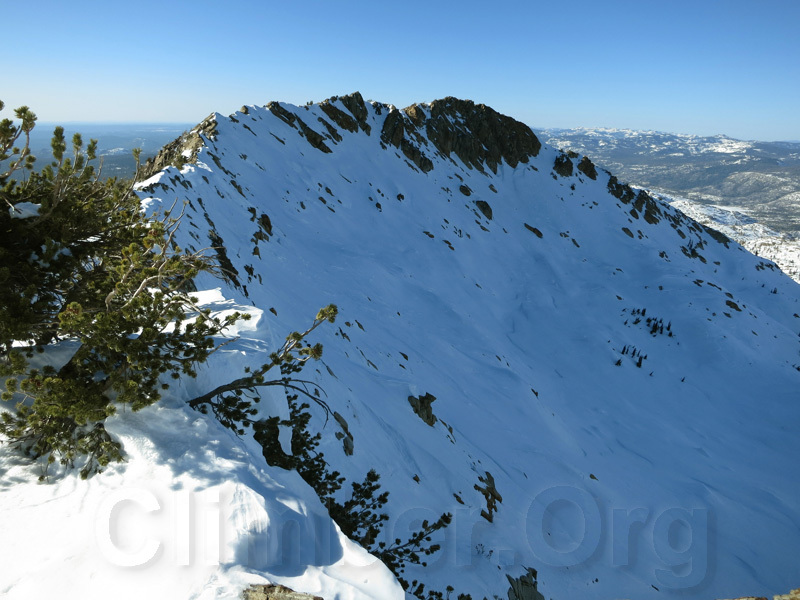 Note that the high point of the ridge is NOT the named point, and is far south and about 50' higher than the so-called summit. It was too late in the day to go the wrong direction for the high point, and the ridge was pretty nasty with gendarmes and snow drifts, so I sidehilled some and climbed class 2-3 to the north. I found no register on Red Peak, and a harsh wind was blowing so I quickly dropped into the calm shelter of the bowl above Lake No 5 drainage, then traversed back to the rib and camp. The way I returned was better than the way I climbed, since it avoids the tedious ridge, unless you want more exciting climbing and better views from the ridge. Red Peak took about 2 hours to climb and 1 hour to return, so I had plenty of time to make camp before dark. It was 20 deg shortly after dark, 5 deg overnight, and again the National Weather Service forecast was wrong by 20-30 degrees. The next morning was kind of a problem, because my boots were frozen solid and I hadn't really prepared for single-digit temperatures (15 deg bag, finger gloves, etc). I slept in to let it warm up, ate in the tent, got up and left quickly, walked fast, and still had painfully cold toes and fingers. The sun was beating down the day before, but this morning there were dark lenticular clouds everywhere and the sun really didn't warm me until noon. I skirted below Red Peak on the 7.6k contour, dropping slightly and then climbing directly up to Silver Peak (SILVRP, 8930'). Meh. It's a bump. Moving on, I followed the ridgeline toward McConnell Peak. The high point is beyond another surprising knife-edge ridge, and the named peak is beyond that. 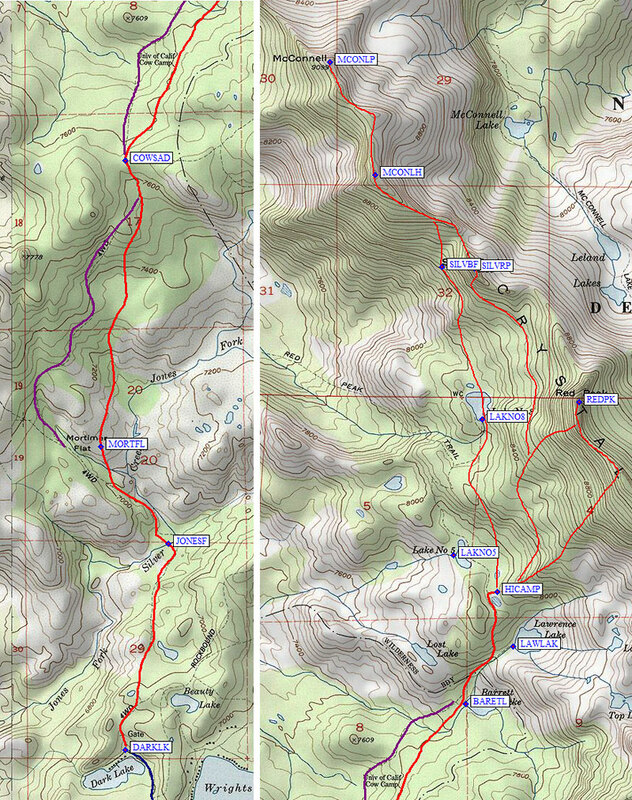 The high point of McConnell (MCONLH, 9120+) is half a mile south of the named point (MCONLP, 9099'), and the map shows one additional contour line for MCONLH. The Peaks and Gorges Section register was on the bump 0.13 miles south of the named point, not as high as the high point and not the place marked on the map. Quite a mess if you care about lists and registers, which I increasingly do not. Going down, I skirted below Silver Peak through a large boulder field (waypoint SILVBF) and took a lower, easier line back to camp. I basked in a sun-warmed tent, packed up and headed out. The clouds dispersed in the afternoon but I wanted to get as far toward the car as I could since the forecast was for rain. My final camp was overlooking the Jones Fork, just north of Dark Lake, where there was a great sunset view and the owls were hooting. It was noticeably warmer and the stars were not in view. Incoming clouds at sunset - fair warning! It started snowing at 4am like someone flipped a switch. It dumped until about 9am, the soft sticky kind of snow that soaks everything. Flakes drifted down lightly until I got low enough that it turned into a drizzle. I was very glad I didn't have to crawl into a tent, but of course the rain stopped entirely just as I started driving home. Click here for a static map of routes and waypoints, or below for an interactive map with just the waypoints.